If you want your taxes raised in 2018, the Arkansas Highway and Transportation Department (AHTD) has a survey for that. The Arkansas State Highway Commission voted unanimously earlier this month to pursue a ballot initiative in 2018 to raise more revenue for Arkansas roads and highways. How that revenue is going to be raised wasn’t specified in the commission’s vote, but a recent survey released by the department gives us a clearer picture of what they have in mind. AHTD’s “Citizens Opinion Survey On Highways In Arkansas” gives respondents six options for “obtaining additional funds” for highways. Five of those six options include tax increases on Arkansans. Taxes outlined for possible increases would be the gas tax, sales tax, diesel tax, and vehicle registration fees. Another option listed is adding a sales tax onto the wholesale price of gasoline. This option failed to pass the legislature in the 2017 session, but it has been revived again after Gov. Asa Hutchinson endorsed putting it on the ballot before voters in 2018. The only survey option for increasing highway funding without raising taxes is transferring sales and use tax revenue on motor vehicles, parts, and service to AHTD’s budget. Currently, this revenue goes to the general fund for state spending obligations that don’t include highway funding. Oddly, the survey fails to mention that Arkansas already has the highest state gas tax rate in the region (21.8 cents per gallon) when compared to surrounding states. Arkansas also has the second highest sales tax in the country. Arkansas voters approved a half-cent sales tax increase as recently as 2012 (set to expire in 2022) to pay for highway improvements. AHTD also requests that survey respondents supply their contact information and asks them if they’d be willing to sign a petition for the “highway revenue” proposal for the 2018 general election. An AHTD spokesman said the contact information wouldn’t be used to collect signatures for the petition. No, that would likely be construed as an improper use of state resources. We ask for optional contact information in case we need to circle back with someone for clarification regarding any of the priorities they listed in the survey. Additionally, the inclusion of contact information helps validate the survey and keeps the results from being skewed – like one person anonymously sending the same responses repeatedly. Groups submitting petitions to get on the ballot in 2018 are due July 13, 2018. 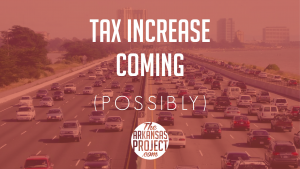 If this survey is any indication, Arkansas voters will likely be seeing a plan that’s heavy on tax increases and low on prioritizing existing state revenue to fund Arkansas’s highway system. ← Should You Be More Afraid of Carjackers — or the Zippers on Your Pants? Privatize the highway department. Raise the tax on alcohol. Highway funds should be raised from the users who do the most damage to the roads. Tractor trailers running 50 tons are destroying our highways. RAISE the Diesel fuel Tax. We managed to tolerate the price of gasoline from over $3.oo a gallon and now it is just over $2.00 we could live with a increase on gasoline tax. The more gas used means more miles driven on the roads.This relates directly to the user of the road. This appears fair to me.